“There are two simple reasons for this: usage of Google Reader has declined, and as a company we are pouring all of our energy into fewer products,” Google said in its Google Reader blog. The death of one Big fish creates space for many small ones. Likewise, this news creates opportunity for many Feed Reader services like Feedly, Netvibes etc. The Feedly has garnered the huge Google Reader users and improved their design, performance. But Personally I don’t like the Feedly, So I have been searching for the best Google Reader Alternatives and find out the “The Old Reader”. I’m using this new Google Reader Alternative for the past three months. I have tell you that the Old Reader is best RSS Reader after the Google Reader. The Old Reader design mimics the Google reader and has many features similar to Google reader. The user interface has two post view mode: List View, Full View. Also, Old Reader marks your feed posts when you scroll the list, You can change this in settings page. It is pretty useful feature to have. It offers the extensions for all major browsers like Chrome, Firefox, Safari and Opera. This extension mainly notifies you about the new unread items in the browser, you can easily track the updates without delay even if you have closed the old reader site. To use Old Reader, first Create the account using Google, Facebook or Old Reader Account. At the launch time, it only offers sign up using Google only. Now you can create an account with your email address. Now Google Takeout tab will open and will show you the number of files and file size. Just click the ‘Create Archive’. Now you will get Zip file containing your Subscribed RSS feeds data. Save this zip file in a safe place. You can use this file to move your favorite RSS Feeds to any Feed Reader service. Open the Old Reader site and click the Import Button in upper right corner. Now Unzip the Downloaded Google Reader Zip file and upload the subscriptions.xml to Old Reader. Click the import button to migrate all your Feeds to Old Reader. 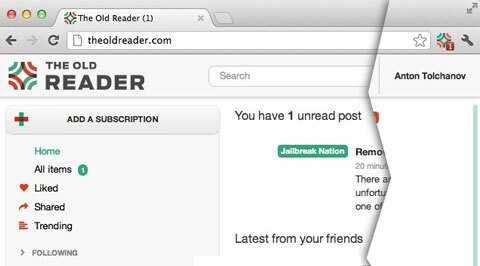 The Old Reader Organize your feeds like Google reader. You can share any posts with Facebook and also add note when sharing. Old Reader has ‘find friends’ options which allows you read feed with your friends. You can also comment to posts which was shared by your friends. Also, It has Pocket(Read It Later) Integration, so you can access the content later by using this app. It has the super feature called ‘Dead Feeds’ which will show the non updated feeds in at least three months. You can use this feature to clean the feed list. Overall the old Reader is the decent alternative to Google reader and fetches the content very fast and offers shortcuts like Google Reader. If you are searching for the best Google Reader Alternative, the Old Reader is great choice to try.